KIEV, Ukraine -- Ukraine's new pro-Russia prime minister, Mykola Azarov, has enraged feminist groups by suggesting that women are unsuitable for high political office and incapable of carrying out reforms. Mykola Azarov said conducting reforms was 'not women's business'. Women's groups in Ukraine have angrily reported Azarov – who presides over an all-male cabinet – to the country's ombudsman following his remarks last week. They accuse him of gender discrimination and holding Neanderthal views. Speaking on Friday, Azarov said Ukraine's economic problems were too difficult for any woman to handle. "Some say our government is too large; others that there are no women," he said. "There's no one to look at during cabinet sessions: they're all boring faces. With all respect to women, conducting reforms is not women's business." Ukraine's new woman-free government was capable of working 16 hours a day with "no breaks and weekends", Azarov boasted. The prime minister's gaffe echoes comments made recently by the man who appointed him – Ukraine's new president, Viktor Yanukovych. During February's election campaign, Yanukovych declared that his female opponent, Yulia Tymoshenko, should "go to the kitchen". 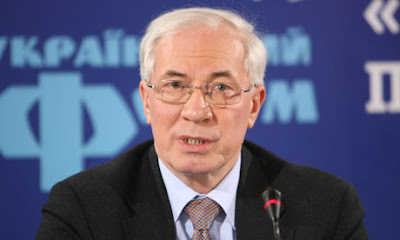 Today, Azarov's political enemies denounced him as an unreconstructed dinosaur. They said his derisory remark, snubbing half of the country's 46 million population, underlined just how out of touch he is with ordinary Ukrainians.